Crimson poppies growing on the side of a hill among the terraced grape vines in the Bouches du Rhone area of Provence in France. The wild crimson poppies can be found growing in many spots around France rearing their gentle flower heads as they sway in the breeze. On the terraced slopes of Provence, the poppies are companions to the grape vines near the town of Montcalm in the Bouches du Rhone area.Grape Vines and poppies in a field near the town of Montcalm, Bouches du Rhone, Provence, France, Europe. 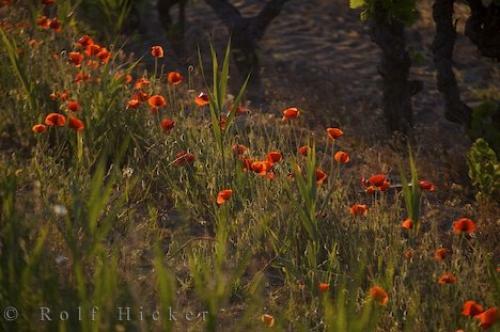 Photo of crimson poppies and grape vines across the hillsides in the Bouches du Rhone, Provence in France, Europe.